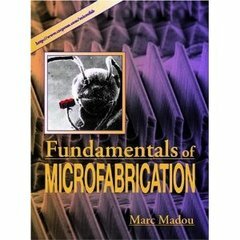 Madou, Fundamentals of Microfabrication: The Science of Miniaturization, 2nd. ed. Fundamentals of Microfabrication: The Science of Miniaturization, 2nd. ed. MEMS technology and applications have grown at a tremendous pace, while structural dimensions have grown smaller and smaller, reaching down even to the molecular level. With this movement have come new types of applications and rapid advances in the technologies and techniques needed to fabricate the increasingly miniature devices that are literally changing our world. A bestseller in its first edition, Fundamentals of Microfabrication, Second Edition reflects the many developments in methods, materials, and applications that have emerged recently. Renowned author Marc Madou has added exercise sets to each chapter, thus answering the need for a textbook in this field. Fundamentals of Microfabrication, Second Edition offers unique, in-depth coverage of the science of miniaturization, its methods, and materials. From the fundamentals of lithography through bonding and packaging to quantum structures and molecular engineering, it provides the background, tools, and directions you need to confidently choose fabrication methods and materials for a particular miniaturization problem. In-depth coverage of bio-MEMs, RF-MEMs, high-temperature, and optical MEMs. Why Use Miniaturization Technology ?